Puissance is power, might or force, and that defines a Poogle to a T. Poogles are amazing little power balls, complete dynamos! 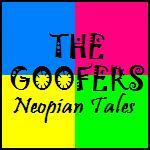 They are one of the happiest and most optimistic of all Neopian species. Additionally, Poogles are ferocious in the Battledome and they give an owner a wide variety of choices in colors and customization. Nearly always sunny and effervescent, most Poogles go through life singing and dancing. After all a Poogle’s best feature is its amazing smile! They are generally musically gifted and most assuredly jolly. Poogles are sweet, affectionate, intelligent and fiercely loyal. After owning pets that are demanding and spoiled, Poogles can be a very refreshing change of pace. While it’s true they enjoy getting new things as much as the next pet, more often than not, a Poogle will actually devise a method of earning what they want, rather than just demanding it. They are known for being clever and industrious—not whiners. Of course, there are exceptions--color is a major factor is these situations. Your grey Poogle is, in all likelihood, going to be a gloomy, despondent type. I really hesitate to say it, but my experience has shown that plushie Poogles, while adorable and snuggly and generally happy little critters, also tend to be a bit dim-witted. If you find yourself in this situation, know that reading helps a lot. Robot Poogles not only look tough, they are the best color for the Battledome. This is typecasting again; however, of all the colors, the royals definitely have the highest tendency towards the demanding spectrum. The average MSPP--if there is such a thing--is an inwardly happy pet but comes with a healthy dose of mischief and cunning. When this is mixed with a high IQ, it becomes a dangerous combination, suitable only for experienced owners! Don’t let that cheerful disposition lull you into believing this pet is a pushover. If you have never taken a Poogle into the Battledome, you’re in for a surprise when you do! Even the most mild-mannered, pampered Poogle can turn into a ferocious, battling beast once inside the dome. Naturally designed with protective capabilities, Poogles come with three species-specific attack abilities. They are the Poogle Bite, the Poogle Roll and the marvelous Poogle Jump. Every Poogle has a few must-have items for their grooming kit. A Pink Poogle Loofah is essential (even for the males). Poogles need to exfoliate often to keep their skin nice and Poogle soft. They generally hate combs but a nice soft brush like the Gold Brush will work wonders on them. This is a little strange, but I haven’t met a Poogle yet who didn’t adore Mushroom Toothpaste. There’s something about Poogles and truffles. They will use other flavors of toothpaste, but if you really want to impress them, get them the Mushroom flavor. Poogles tend to prefer petpets from a small, select core. A Tapira, Floud or Angelpuss makes a great petpet on a budget. If you’re looking for a jolly, plump, chattery friend for your Poogle, get him or her a Polarchuck. For the right Poogle, a Mazzew makes a great choice. Another cheerful soul, the Flowper is a fantastic petpet for nearly every Poogle. Not every Poogle can handle a Gallion, but it’s a fantastic choice for a Poogle that needs a challenge. 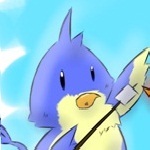 Lastly, the Kazeriu is an excellent choice for nearly every Poogle—they are not only clever but magical as well! Some Petpet warnings: Stay away from any Petpet that looks edible, unless you wish to tempt disaster! Avoid water-loving petpets, unless you have a Maraquan Poogle. It’s also best to bypass any petpet that is a large eater as it leads to unhealthy competition. The fashion-concerned Poogle will be interested in owning several outfits so they can look their best no matter the situation. For female Poogles on shopping day, essential wear includes the Green Knit Poogle Dress, Green Knit Poogle Purse and for the young pets the Green Poogle Rag Doll. 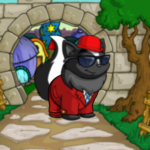 This outfit goes from ordinary to amazing with the addition of the Black Poogle Shoes, Red Poogle Bows and the Neopian Marketplace Background. Fitness conscious Poogles will either be tempted by the Ballerina look (Poogle Tutu, Poogle Pink Tiara and Poogle Ballet Shoes) or the Jogging outfit (Poogle Running Suit, Poogle Sweat Band and Poogle Running Shoes). If you have a Poogle interested in fitness, it is best to do all you can to support them, as many Poogles have a tendency to get pudgy. Depending on your Poogle’s personality, they may lean towards one of four ensembles: Career Focused—consists of the Poogle Firefighter Jacket, Poogle Firefighter Trousers, Poogle Firefighter Helmet with the Poogle Firefighter Boots; Punk—encompasses the Poogle Punk Jacket, Poogle Punk Collar, and Poogle Mohawk; Retro—which combines the Retro Poogle Poogle Skirt, Retro Poogle Skirt, Retro Poogle Scarf and Retro Poogle Shoes; and Eclectic—this look mixes and matches the best pieces from any ensemble to create a look entirely unique. A possible example would be the Retro Poogle Skirt and Retro Poogle Scarf with the Poogle Punk Jacket and Poogle Punk Collar. Another interesting mesh would be the Poogle Tutu with the Poogle Punk Jacket. Poogles can be a difficult species to customize, but there are a few guidelines. First, color is essential. Not every Poogle can pull off the bright yellow of the firefighter outfit, nor can all Poogles wear the bright pink of the retro outfit. In fact, as adorable as the Poogle Mohawk is, the fact remains that it won’t look amazing on every Poogle. Find what works for your Poogle and then stick with it. Secondly, Poogles look amazing in two items—T-shirts and hats. Use this knowledge to your advantage! If you’re looking for a pet that can cheer you up (or at least keep you on your toes), if you’re tired of spoiled, demanding pets, if you’re in need of a battling companion, seeking a fellow music aficionado or searching for a friend with which to enjoy some fine cuisine, then a Poogle is the pet for you. A Poogle is a happy, loyal companion—a friend for life.